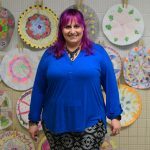 We continue our Original Works Stand Out Teacher Series this month featuring a Q & A with art Teacher Margaret McDonald (aka “Miss Bright Blue Hue”), a 12-year school teacher at Herndon Elementary School District in Northern Virginia. Ms. McDonald is active on social media and online. 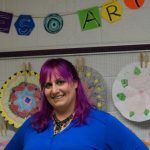 Her blog, Miss Bright Blue Hue chronicles her life as an art educator. She posts everything from lessons taught in her class to her outfits that she wears daily. Her most popular section is the Sticky Note Challenge, where she encourages her students to answer a question on a sticky note. What grades do you teach and how long have you been teaching art? I teach grades Pre-K through 6th. I am in my 12th year of teaching. I teach a diverse community of students in Northern Virginia. What was it that sparked your interest in becoming an art educator? When I was in college, I took a lot of studio classes when I decided that I wanted to make an impact on the world. I knew that being a studio artist was not the only way I could do that. I also have the belief that every child has an urge to impact their world and the ability to create. Teaching art has proven to me again and again that when a child is given the opportunity for curiosity, exploration, imagination, new materials, challenges, and risks, that learning and ability to create is awakened and expression is born. Do you have a particular art medium you like to use in your classroom? I love painting with my students. I am not afraid of messes. I’ve been known to paint with kindergarteners on their first day of art! I love BIG moments and those come when I take a risk or challenge my students. I am always looking for new ways to apply paint to surfaces such as using a fork or bottle caps. It’s such a wonderful way to fully engage students and see their expression. Tell us one of the more memorable things that a student has done in one of your classes? It is important to me that my students know they are artists and that we can create and make anything. Often my students who range from PreK-6 while working on a project will come up to me and say, “Do you like mine?” This happens often and as I taught, I wanted to find a way to somehow change my students’ thinking so that they knew they are artists and their work is fantastic! I began to show my students more of my own art. I wore things that I made. I referred to them and myself as artists, architects, or engineers. If they know I am an artist, they know they can be one too. Slowly the constant “Do you like mine” was less. One day, a 2nd grader said, “I think I’m an artist!” It was the most joyful thing for me to witness when knowledge and experience connect with creativity and imagination. Is there anything you would like to share with your peers about your career as an art educator? Over the last few years, I have been teaching adapted art in my classroom. During my career, I have been so fortunate to teach many different students with many opportunities to adapt my art lessons and my art room space. I really enjoy creating art with students with autism. I have adapted many lessons to meet the goals of my students. I took a graduate course focusing on “Art and Autism.” The times during my week that I teach my adapted art classes are my favorite. It really fills my art teacher soul and excites me knowing there is so much to learn as I grow alongside my students with autism. What made you decide to use Original Works? Original Works (OW) is a fundraiser that my school has used for years. The students, teachers, and parents look forward to it every year. Our PTA supports this program and parent volunteers help organize the school-wide fundraiser. I plan a colorful, vibrant, energetic lesson and OW has always done a great job on their products. The art is reproduced so beautifully on everything Original Works offers. How have you used the funds raised by your Original Works program? Our Original Works funds have supported the purchase of enrichment items for students and classrooms. Some of the things the funds helped purchase are iPads and document cameras. If you missed the first entry in our Original Works STAND OUT Teacher Series, you can read our conversation with Kathy Barbro here. What’s New For Spring 2018! What Generates Successful School Fundraising? I just love these stories, they make my heart sing!